A page from the 1939 edition of Technique, the yearbook for the Massachusetts Institute of Technology (MIT) in Cambridge, Massachusetts. 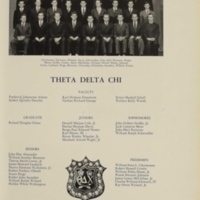 This page shows the Theta Delta Chi, a social fraternity. A notable student listed is Major Jack Cameron Heist (1919-1944), who is pictured fourth from the left in the second row. Maj. Heist was born to Henry S. Heist and Christina Heist on November 6, 1919, in Eustis, Florida. He received his commission on May 29, 1939, to serve in World War II. Maj. Heist was an Ammunition Officer for the XIX Corps. He died during his service in an ambush on September 2, 1944, near Thiant, France. He is currently buried at the Epinal American Cemetery and Memorial in Dinozé, France. Maj. Heist is one of 85 Florida residents interned at Epinal. Digital reproduction of original yearbook page: Technique (Cambridge, MA: Massachusetts Institute of Technology, 1939), page 265. http://interactive.ancestry.com/1265/40392_B075330-00265/240315196?backurl=http://person.ancestry.com/tree/38722788/person/20409592223/facts. Technique (Cambridge, MA: Massachusetts Institute of Technology, 1939): Source Repository. Copyright to this resource is held by The Wilkes-Barre Record and is provided here by RICHES of Central Florida for educational purposes only. 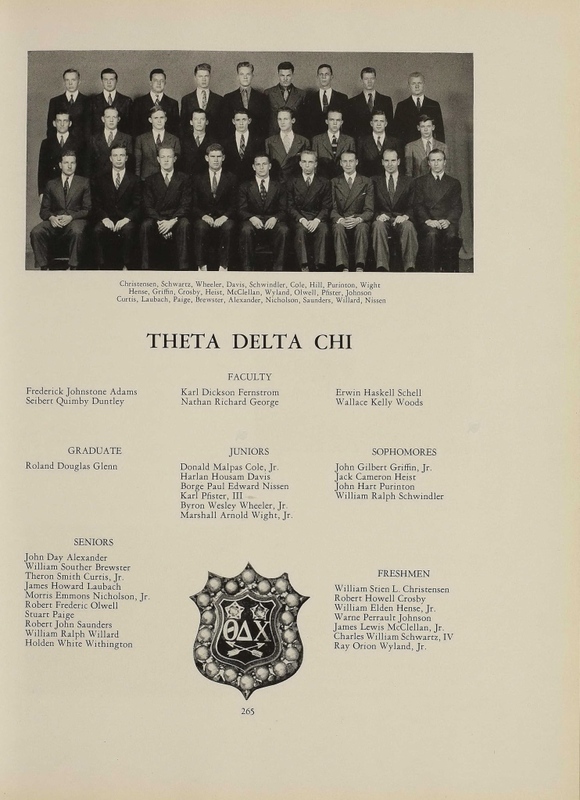 “Massachusetts Institute of Technology Theta Delta Chi, 1939.” RICHES of Central Florida accessed April 20, 2019, https://richesmi.cah.ucf.edu/omeka/items/show/6981.